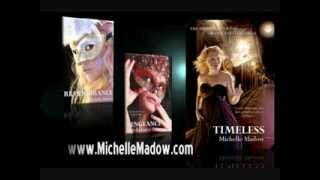 Michelle Madow has read 18 of 50 books. Michelle Madow read 88 books of their goal of 70! Michelle Madow read 69 books of their goal of 50! Michelle Madow read 75 books of their goal of 70! Michelle Madow read 55 books of their goal of 50! Michelle Madow read 83 books of their goal of 50! Michelle Madow read 116 books of their goal of 100! To ask Michelle Madow questions, please sign up. how hard was it for u to become an author? All the elementals book have a different face on their covers...R they the ppl who hold the five elments:Earth, Fire, Water, Air, n spirit?? Description: Sneak peak of Chapter One of Elementals: The Prophecy of Shadows! Description: The preface of Remembrance, my debut YA romance novel. Enjoy! We’d love your help. Let us know what’s wrong with this preview of Magical Creatures Academy 1 by Lucia Ashta. We’d love your help. Let us know what’s wrong with this preview of The Bane Chronicles by Cassandra Clare. We’d love your help. Let us know what’s wrong with this preview of Like Never and Always by Ann Aguirre. We’d love your help. Let us know what’s wrong with this preview of The Angel Secret by Michelle Madow. hi again Michelle ! i`m currently reading transcendence :) im really addicted in your series ( their in my list of favorite-of-all-time) ! gosh ! how i wish i can meet you :( but nevertheless goodluck to your new series, i`ll be looking 4ward to it .. i see your also reading Cassandra Clare`s work, im also too .. hhaha .. godbless ! Gabriella wrote: "I just saw that you live in Boca. I'm from Boca, what a coincidence.. I have not really seen many people on here from this area :)"
hi ! i`ve already finish REMEMBRANCE & VENGEANCE and i`m waiting for TIMELESS ! i`m very vry very excited .. i hope it will be great and i`m sure it will .. love you michelle ..
Have you read any of Susane Colasanti books? I read parts of one yest and couldnt put down, while at bookstore, ended up buying it. Thanks for the add girl! Hiya Michelle thanks so much for the request! Hi Michelle. Thanks for the add. I look forward to reading your books!! Jen (Dream Reads) wrote: "Hey Michelle! Thanks for accepting my friend invite! :)"
Michelle wrote: "Jenia. wrote: "That cheap, maybe once i get kindle or nook, i get it. I don't have either at moment. But It getting hard put yopur book down, only reason i did because of homework." Jenia. wrote: "That cheap, maybe once i get kindle or nook, i get it. I don't have either at moment. But It getting hard put yopur book down, only reason i did because of homework." That cheap, maybe once i get kindle or nook, i get it. I don't have either at moment. But It getting hard put yopur book down, only reason i did because of homework. Jenia. wrote: "Michelle wrote: "Jenia. wrote: "I started Remebrance. It's really good so far :)"
Awesome!! If you choose to review it, let me know when you do!! Im planning on it. I review most of books i read..."
Michelle wrote: "Jenia. wrote: "I started Remebrance. It's really good so far :)"
Awesome!! If you choose to review it, let me know when you do!! <3"
Im planning on it. I review most of books i read but i will send you link to my blog once i review it. Do you happen know if your other book Vengeance availble at library anywhere?, i dont have money to buy it right now but i want read it as well. Jenia. wrote: "I started Remebrance. It's really good so far :)"
Hey under my writing, i posted story i been working on. It not finished, i am just letting you know, in case you were intersted in reading it. Michelle wrote: "Jenia wrote: "Michelle wrote: "Jenia wrote: "Even though i wished you Happy birthday on FB, decided to say on here as well. Happy Birthday! I'm glad i met you, you seem like such sweet girl so hope..."
You same age as me. I turned 25 in Novemeber. LOL. Usually i meet people much younger then me. You look younger then 25. Jenia wrote: "Michelle wrote: "Jenia wrote: "Even though i wished you Happy birthday on FB, decided to say on here as well. Happy Birthday! I'm glad i met you, you seem like such sweet girl so hope you have an a..."
Michelle wrote: "Jenia wrote: "Even though i wished you Happy birthday on FB, decided to say on here as well. Happy Birthday! I'm glad i met you, you seem like such sweet girl so hope you have an amazing day." You welcome! How old are you now? Jenia wrote: "Even though i wished you Happy birthday on FB, decided to say on here as well. Happy Birthday! I'm glad i met you, you seem like such sweet girl so hope you have an amazing day." Even though i wished you Happy birthday on FB, decided to say on here as well. Happy Birthday! I'm glad i met you, you seem like such sweet girl so hope you have an amazing day. Michelle wrote: "Jenia wrote: "Michelle wrote: "Jenia wrote: "Hey Michelle, how are you? I have finally recieved Remebrance in mail today so i will read as soon as i finish books i got from library since they due ..."
Allright, I will contact you once i read it, review it. You know you inspired me to finish my own book i started year ago. Jenia wrote: "Michelle wrote: "Jenia wrote: "Hey Michelle, how are you? I have finally recieved Remebrance in mail today so i will read as soon as i finish books i got from library since they due soon. By way i..."
Michelle wrote: "Jenia wrote: "Hey Michelle, how are you? I have finally recieved Remebrance in mail today so i will read as soon as i finish books i got from library since they due soon. By way i love the title a..."
Jenia wrote: "Hey Michelle, how are you? I have finally recieved Remebrance in mail today so i will read as soon as i finish books i got from library since they due soon. By way i love the title and the cover." Hey Michelle, how are you? I have finally recieved Remebrance in mail today so i will read as soon as i finish books i got from library since they due soon. By way i love the title and the cover. Michelle wrote: "Jenia wrote: "I just ordered Remebrance from Amazon. I been wanting to read it for while." Yay!! I hope you enjoy it :)"
Jenia wrote: "I just ordered Remebrance from Amazon. I been wanting to read it for while." I just ordered Remebrance from Amazon. I been wanting to read it for while. I got a gift card for Amazon from brother and i was wondering if you had any suggestion for book. I am getting yours but i want get some others as well. By way, I'm following you in Twitter. My sn is ISF_Jenia, wasn't sure if you noticed it or not. Hey, My mom said she can drive me for your signing so i see you there! Can't wait. Thanks for your book tour invite! I'll try to make it :) Im in college, what day are you coming to MD? Paige wrote: "So happy you are touring. See you in Newport Beach CA!!! Can't wait!!" So happy you are touring. See you in Newport Beach CA!!! Can't wait! !